This entry was posted in art, Drawing, ink drawing, outsider art and tagged earthworm, lovelessness, misery, the void, William Blake, worm. Bookmark the permalink. interesting. is there a story behind this piece? Yes and no, dear sister Amy. I figure anyone understands this picture who has fallen into estrangement in a love relationship. Actually I first sketched it out a while ago, feeling stung and rejected, affection unrequited. Only recently, with time and distance, have I developed the image more to completion. It’s not a revenge image. Hopefully I pulled it out of the too subjectively personal, with the light of the Universal now falling on it. I should probably draw a counterpart, where there’s a man instead of a woman. I was also thinking of that Biblical saying: “Though I speak with the tongues of men and Angels, and have not love, I am as sounding brass, or a tinkling cymbal.” This drawing is a rendering of the invisible made visible, of a consequence of heartlessness, of living without loving. A void opens up in one’s center, which begins pulling everything into its vortex, converting everything into a lowly negative, cold and wet, like an earthworm. To confess, this quite often happens to me. I feel it to be a real danger, especially as I grow older. I can be quite cranky! 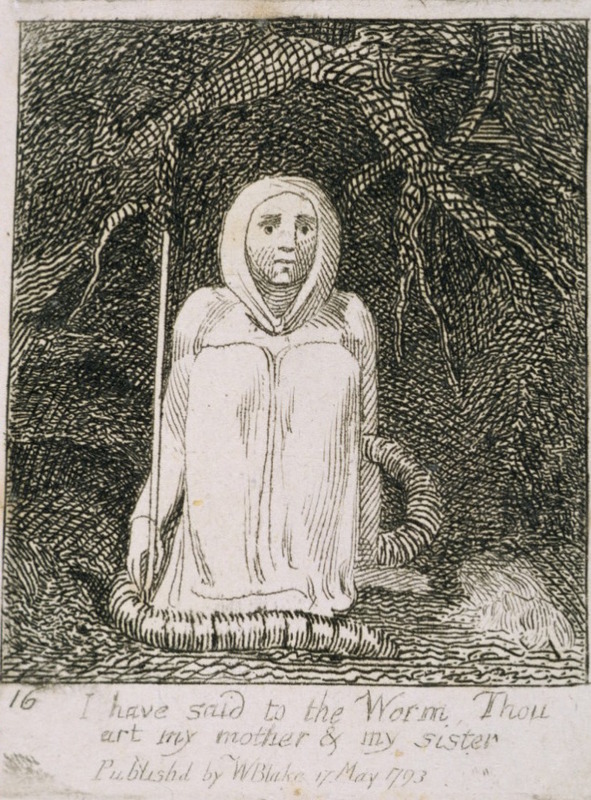 I like the connection also to William Blake’s etching. I think however he had more elemental earth in mind, the place to which we all must return after we’ve lived our lives: to the soil. The worm symbolically depicted in his etching isn’t necessarily a bad thing. It’s a reminder of our mortality, something we can’t get away from and would do well to accept. O Worm, Thou art also a brother! Thanks for giving me an opportunity for a little commentary on this picture. I’m very grateful for you in my life. I love you too!